Remember when Joan Crawford went all Mommy Dearest on Christina when she discovered that wire hanger in her closet? Well that’s kind of how I feel about visible plate hangers. You know I love a great plate wall. When I got my new industrial metal cabinet in the dining room, I had to remove the plate wall (sob)! 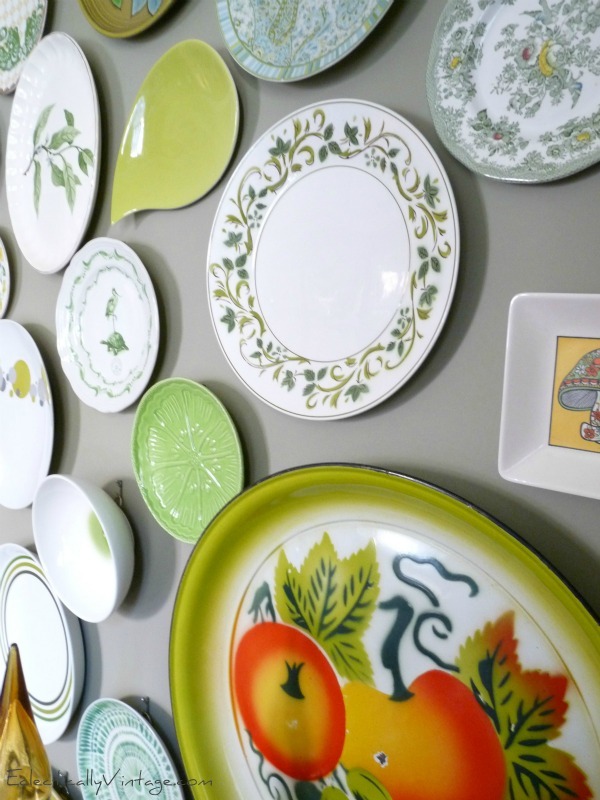 That plate wall completed me – so I am determined to find a place for it if it kills me. Over the years, I’ve gotten tons of emails and questions asking how I hang my plates without those visible plate hangers. 1) Invisible Plate Hangers – These are my BFF. Simply stick them on to the back of plates (they come in lots of different sizes) and hang. It’s that simple. 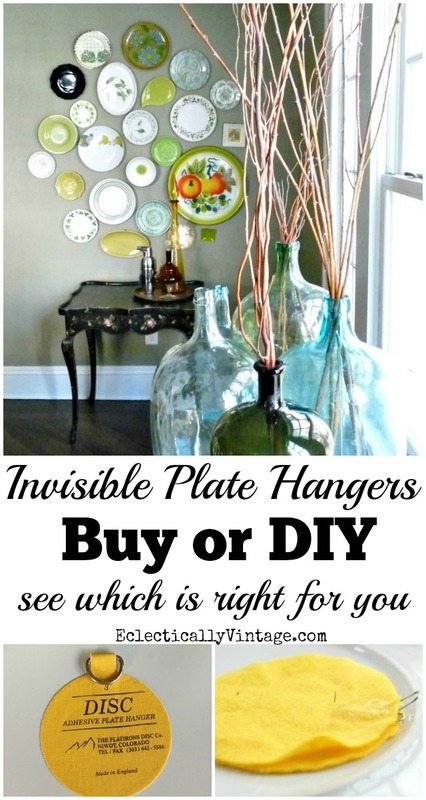 2) DIY Invisible Plate Hangers – I shared this simple way to make your own plate hangers. Joan Crawford would be proud. 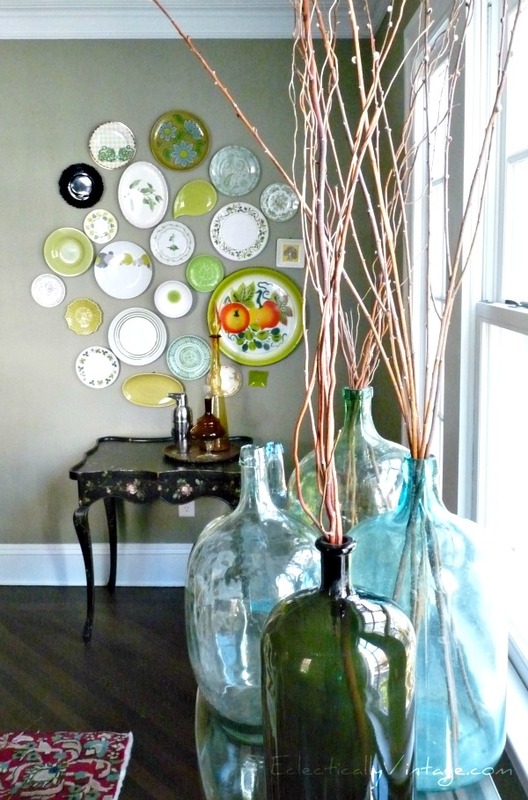 I love those plate hangers…have pitched most of my wire ones and only using these…I was a bit skeptical at first, worrying that it would not hold and the plate would come to its demise…but they work so wonderfully!…I adore your plate gallery wall…so beautiful! I hung one of my treasured great grandmother’s china bowls with one of the disc hangers. About a year later, I heard a crash in the middle of the night and, so sadly, it was that bowl. Mind you, this was not a large or heavy bowl at all and I carefully followed all the directions but it did not work for me and to this day, I regret having sacrificed that lovely, irreplaceable bowl to these disc hangers. I immediately removed all the other ones I had used to hang anything. I’d so much rather have the hangers show a little than loose another treasure! I hate those plate hanger things i am going to try these disc’s, thanks Kelly. Ha that’s the secret, awesome! I need to find those! Thanks Denise – it’s such a fun platter!